David's Doctoral Research Space – Page 2 – How many movies, memes and gaming references can one man fit into a thesis? I think this story is best left to tell itself. This story happened on a Minecraft server built for people with Autism to find a safe place to play Minecraft and interact with people who understand them. Angela was on call when a young boy with autism — who I’ll call Tim — came up to her for help. Tim’s friend had recently committed suicide, and it was clear he was shaken and upset. Within minutes of talking, Angela understood that Tim didn’t have a family he felt comfortable talking to. Running through her own mental checklist, Angela suggested that, if comfortable, he should seek out and talk to a guidance counselor or school therapist. But Angela knew Tim needed help right away. “You need to find some help but how can I help you right now? How can we help release all this that you’re feeling?” she asked. Tim asked Angela if she’d help him build a memorial for his friend and the two began constructing: Tim built a cross out of some stone blocks; Angela planted flowers. Later, Tim fashioned a sign, which he hung on the stone cross. “You will never see the stars if your head is always down,” it read. Angela invited some of the nearby children to see what Tim had built. One by one they offered up their support, taking turns embracing him. The next day, Tim confessed that Angela’s support had helped him feel better about his friend. Tears in her eyes, Angela watched as Tim disappeared from view, heading off to build or join a quest. Or maybe he simply logged off. Autcraft, upon its inception, found itself in the spotlight. Administrators received hundreds of emails a day from parents who wanted a safe place for their kids with autism and Asperger’s to play Minecraft and interact with others. It’s likely, without citing research-based evidence, that children with disabilities might seek out computer games an online worlds as a way to help them interact with the real world. Games like Minecraft become a conduit where the game becomes the purpose for such groups to be formed. Players don’t feel threatened by face to face interaction, but can instead use their avatar as a mask. Servers like Autcraft also provide safety from bullying and administrators are trained to help players deal with problems in their real lives. While not overtly educational, there’s a lot of learning happening. Children with difficulties socialising can learn how to be part of a community, participate in events and talk to others. Whether those skills can transcend the gaming world and help children in their real life interactions is something worth further research. Minecraft: The cornerstone of future education? Why the indie success should continue to be used as a learning tool in schools. A lot has been mentioned about Minecraft’s benefit in learning. However it’s rare to hear about Minecraft and learning from a students’ point of view. Students are starting to see the potential of combining their love of gaming and the opportunity to learn in a way which is both motivating and relevant. What does the future hold for games like Minecraft? Is it possible that Minecraft will one day be a part of the common core, or government mandated national curriculum? About the Massively @ jokaydia Guild. Massively Minecraft is a kid-friendy (and parent friendly) community with private whitelisted servers for kids to play on. The premise is to give them a safe place to play, as well as providing an opportunity to develop digital skills, explore creativity and develop good online habits and social skills. The group has been around for about 3 years and boasts a thousand members. Players can progress up the guild’s ranks by taking on tasks and achieving the awards. Doing so gives players increased responsibilities and privileges, while at the same time improving the player’s community skills. Steam Workshop :: MinerFriends – Minecraft. 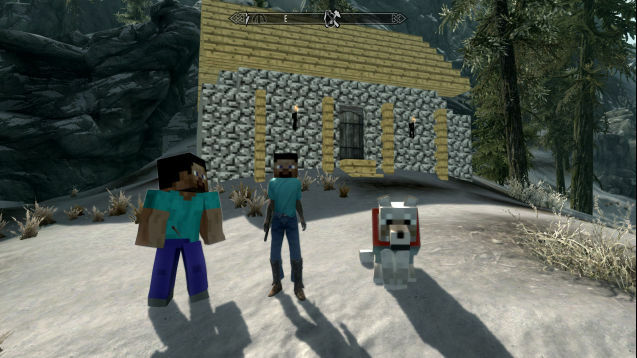 What could be more fun than combining two great games: Minecraft and Skyrim. This is a very fun mod that allows Minecraft styling to Skyrim, modifying the game so that certain elements look like they are directly out of Minecraft. Not a difficult mod to install, but it looks like lots of fun! Middle School Minecraft | Imagine the possibilities…. Great video looking at toxicity in gaming. Computer games are fun and gaming is an important aspect of digital culture. The best part about computer games is that when we play, we learn! This video was made as part of my Masters in Education studies at Griffith University, Queensland, Australia. Contact me or learn more about my other videos, studies and academic writing.